Hi Everyone! It’s Nicky, calling in again from Kitchen Sanctuary. 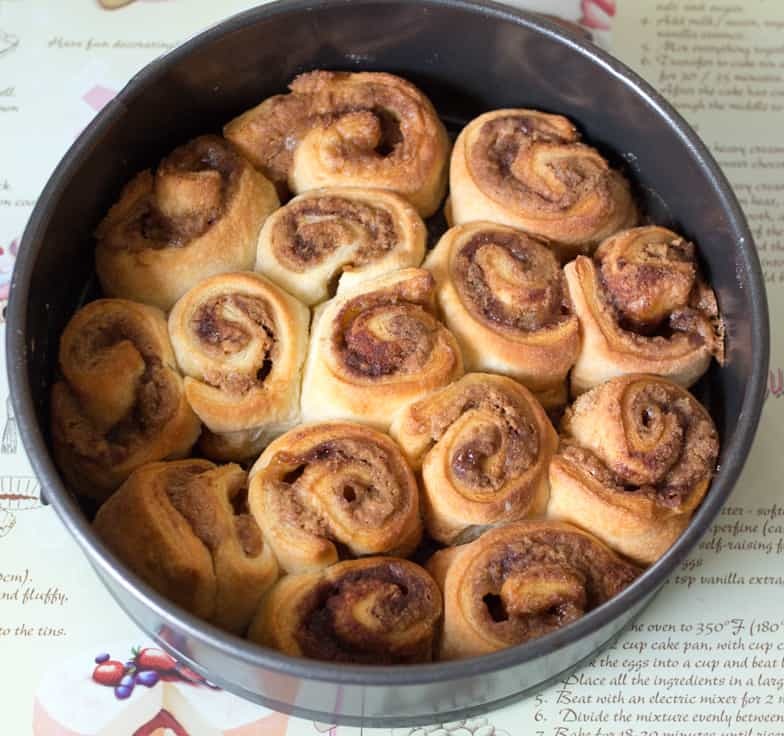 Today I’m bringing you a recipe born from indecision, a leftover tube of crescent roll dough and a serious craving for something sweet. You may remember from those Snicker Brownies I made a couple of months ago, that I like to go a little over the top when it comes to dessert. If you’re going to have a dessert, you might as well really enjoy it right? So, staring into my cupboards for inspiration, my eyes fell on a jar of Biscoff spread. Have you tried it? It’s basically biscuity heaven in a jar (that you want to sandwich between two biscuits before eating – or maybe that’s just me). I decided it would be a perfect addition to some quick cinnamon rolls. Whilst the cinnamon rolls were in the oven, I set work thinking about the glaze. It may have been the best cheesecake-making decision of my life! 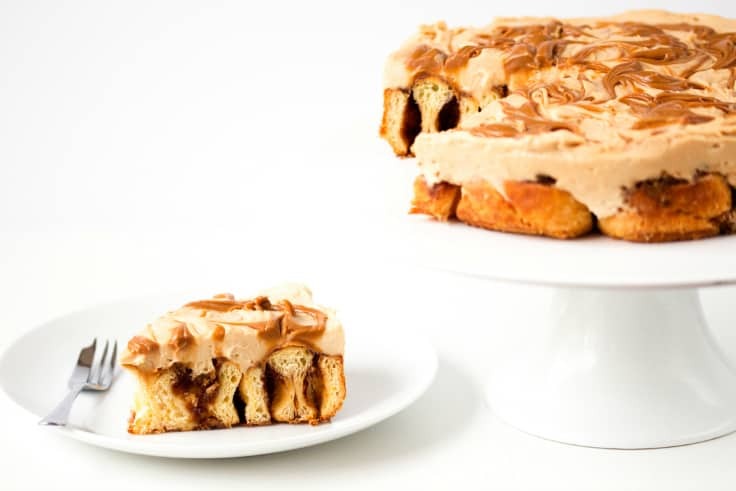 An over-the-top dessert made with fresh cinnamon rolls and cheesecake topping swirled with Biscoff spread! Preheat oven to 375 F degrees. 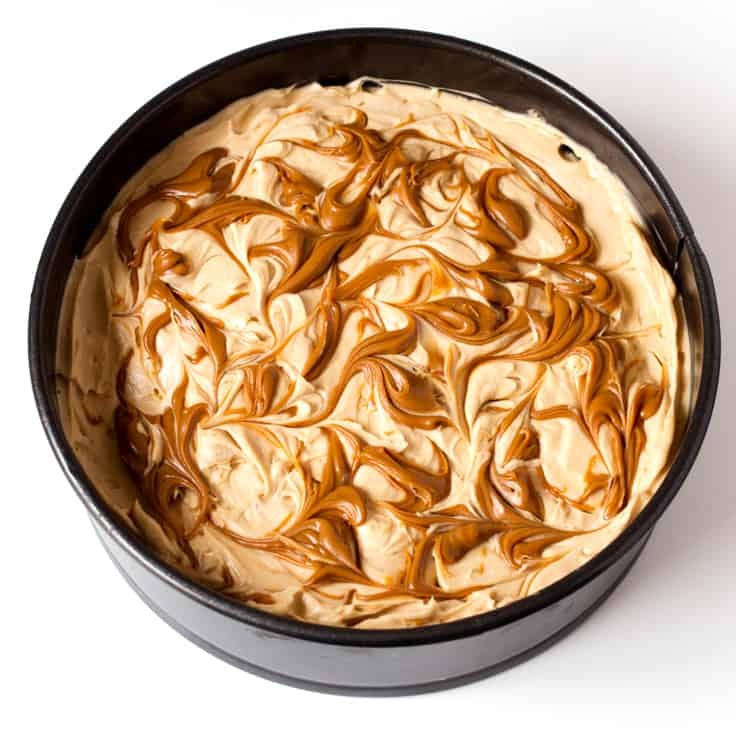 Spray an 8 inch cake tin (with a removable base) with cooking spray. 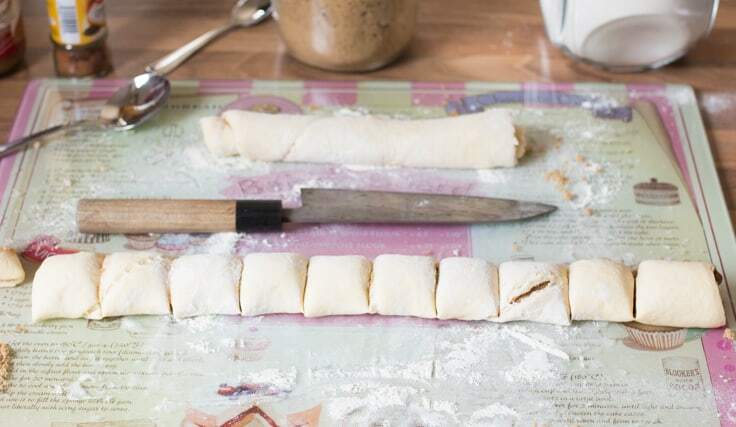 Sprinkle flour over your work surface and unroll the crescent roll dough, so that it’s rolled out horizontally on the work surface (you may have to cut the end off, like I did, if your surface is too small – see picture above). Press any perforations together. 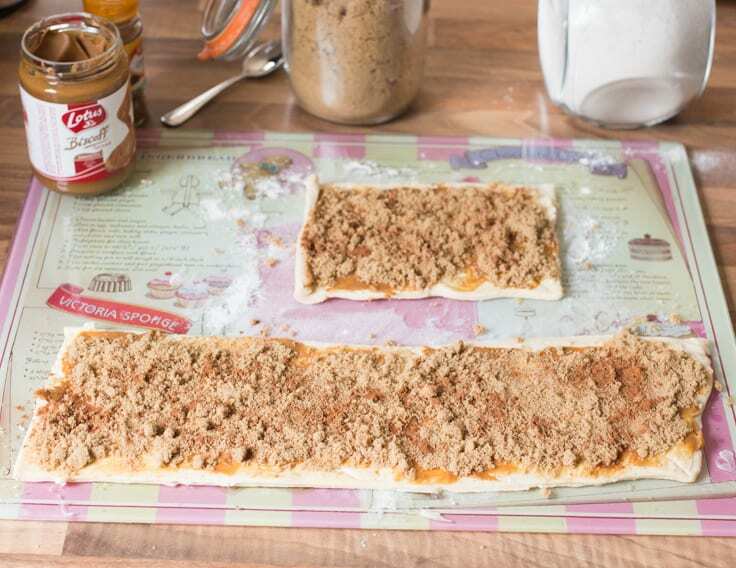 Spread the dough with the softened butter, then spread the Biscoff Spread. Sprinkle with the brown sugar and finally sprinkle on the cinnamon. Roll the dough upwards into a long roll, then cut the roll into small 1.5”-2” pieces. Place the pieces, cut side up into the cake tin – spacing them evenly apart. Then place in the oven and bake for 10-15 minutes or until golden brown. Once it’s cooked, take out of the oven and allow to cool in the tin. 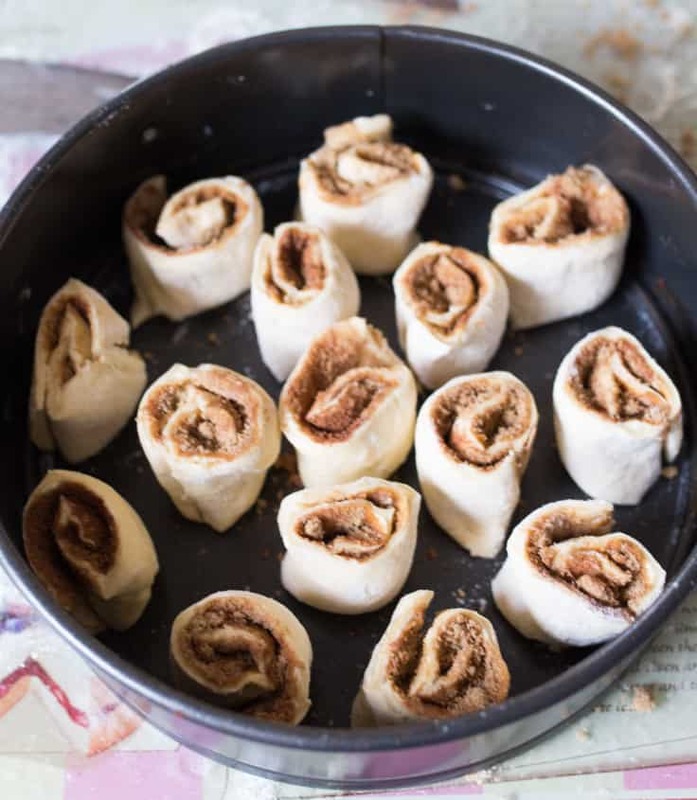 Spread the mixture onto the cinnamon rolls. Smooth the top with the back of a spoon. Heat the remaining Biscoff in microwave for a few seconds to loosen it up a bit, then dollop it onto the cheesecake topping. Swirl the Biscoff around using a cocktail stick. Place in the refrigerator, and allow to chill for an hour or two before serving. My boy is the biggest Biscoff fan, I should surprise him with this! This looks and sounds AMAZING! Thanks for sharing the recipe! 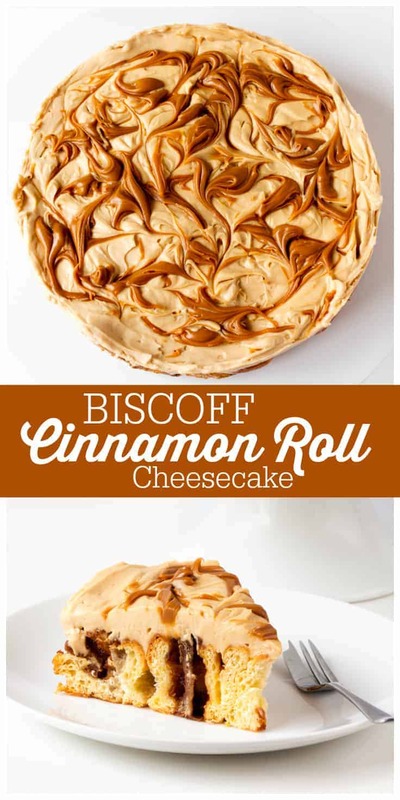 I had no idea how versatile Biscoff was! What a creative and delicious looking recipe. My son loves Biscoff so we often have it in the cupboard too. Thanks for sharing. I pinned! Oh my.. this is one heck of a creation! It sounds delicious! I’m really loving all of your dessert hacks, heck I’m loving all of your desserts!!! I have everything but the spread so I will have to go and buy me some!! This would be a perfect treat for the girl’s craft night. This looks absolutely delicious! I love cinnamon! This looks so delicious! oh my! This looks yummy. I have never heard of Biscoff spread. Must look for it when I’m shopping at No Frills! Its Mouth waterinng. !Loving it.. Great Presentation! 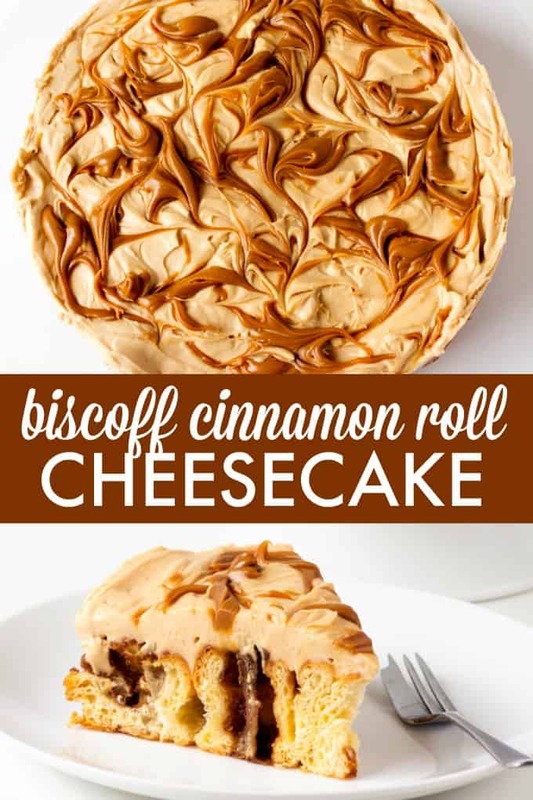 This looks amazing and I would love to give it a try .I have to find the Biscoff spread. I’ve never heard of Biscoff. Is it available in regular grocery stores or specialty/import stores? I have never heard of Biscoff. It really looks delicious, if a bit decadent! Two of my favourite desserts combined! Can’t believe how easy this is to make. yum.so gonna luv.two of my favorites combined.great with my morning coffee as im a sucker for the pastries in the morning. Omgosh!!!! I wish you could’ve shared the cheesecake because I need this like immediately!! Going to the store tonight! I seriously cannot wait!! Thank you for this magical recipe!! FAB.U.LOUS!!! 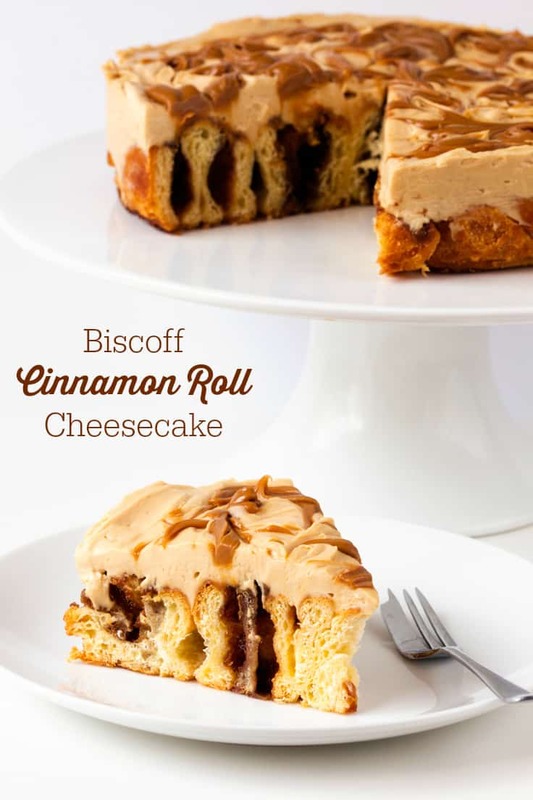 Love all things Biscoff…love the rolls on the bottom too. So glad you shared. Pinning! This looks seriously delicious! Would love for you to share this heavenly dessert at #OhMyHeartsieGirl Wordless Wednesday! Looking forward to seeing you! Gee — does that every look good and decadent! and Nicky! 🙂 sorry about that! Pingback: Creativity Unleashed Link Party & GIVEAWAY!! 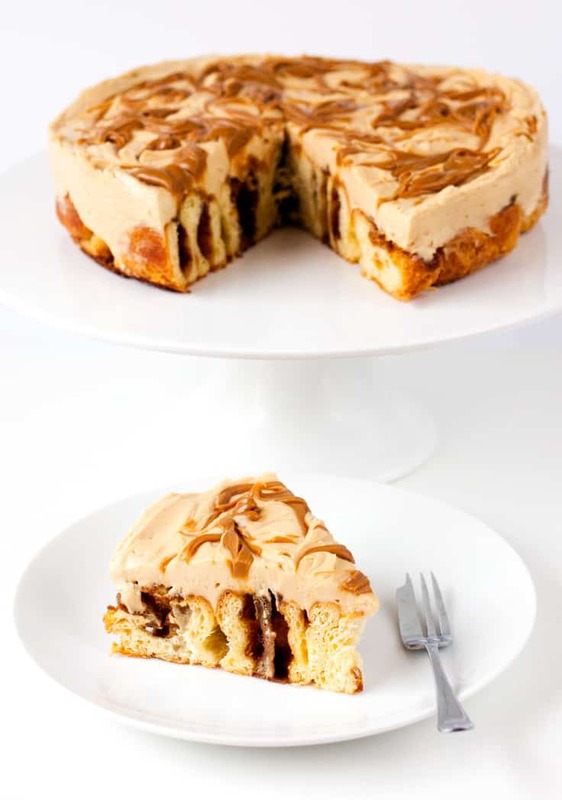 This Biscoff Cinnamon Roll Cheesecake is certainly a different kind of cheesecake but it certainly looks (and tastes) delicious. 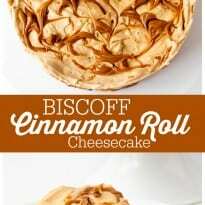 If I find out where to get Biscoff, I will be making this sometime soon.